APC is delighted to recognize the expertise, specialized skills, advanced education and unique experience of professional hospice/palliative care chaplains with a specialty certification beyond the board certified chaplain (BCC) designation. Board certified chaplains who successfully complete the specialty certification process are designated as BCC-HPCC (board certified chaplain - hospice/palliative care certified). The BCC-HPCC credential is a mark of excellence to employers, professional colleagues, patients, families, and the public. It identifies chaplains who voluntarily submitted to a rigorous process of education, training, and evaluation and are dedicated to providing exceptional chaplaincy care through a career-long process of continuing education and peer evaluation. APC/BCCI has developed the BCC-HPCC competencies and requirements based upon the guidelines of the National Consensus Project for Quality Palliative Care. These guidelines support the development and structure of new and existing palliative care services, and are recognized across the country as the professional norm for hospice/palliative care chaplains. Such specialization is increasingly in demand in the interdisciplinary practice of hospice/palliative care. BCCI board certified chaplains who have been certified for at least one year and who have at least three years of clinical experience in hospice/palliative care are eligible to apply for the BCC-HPCC. The instructors are all experienced BCC-HPCC chaplains who will help participants understand the standards and prepare their certification materials. Linda Brown BCC-HPCC is a professional chaplain with experience both in hospice chaplaincy and on interdisciplinary palliative care teams at three different institutions. A former university professor, Chaplain Brown is author or co-author of more than two dozen textbooks and assessment devices. She is currently writing a book on the implications for pastoral care of Dorothee Solle's theology of suffering. She has a doctorate degree in research design and psychological assessment from Kansas State University, and a master's in pastoral theology from Saint Paul School of Theology. She was granted board certified chaplain status in 2008 and hospice/palliative care certified chaplain status in March 2013. She serves on the BCCI Specialty Certification in Hospice/Palliative Care Task Force and is a BCCI area certification chair. Denise Hess MDiv BCC-HPCC is the full-time designated palliative care chaplain on the inpatient palliative care service at Providence Little Company of Mary Medical Center in Torrance, CA. She has a bachelor's degree in psychology, a master's in marriage and family therapy and a master's in divinity. An ordained minister with the Presbyterian Church (USA), she was granted board certified chaplain status in 2011 and hospice/palliative care certified chaplain status in 2014. She has worked in and around the field of palliative care chaplaincy since 2006 and has presented around the country and internationally on the topic of palliative care. 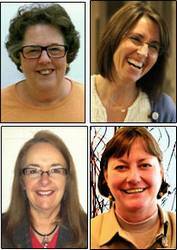 She and her team received The Joint Commission Advanced Certification in Palliative Care in 2014. She serves on the BCCI Specialty Certification in Hospice/Palliative Care Task Force and participated in the writing of the APC Standards of Practice for Professional Chaplains in Hospice and Palliative Care. Her work on palliative care topics, such as miracles and team health, has been published in peer reviewed journals. Anna Lee Hisey Pierson MDiv BCC-HPCC is a staff chaplain at Advocate Good Samaritan Hospital in Downers Grove, IL. She has worked in the palliative care field since 2001. Ordained in the Church of the Brethren, she was granted board certified chaplain status in 2002 and hospice/palliative care certified chaplain status in 2014. She has presented at APC annual conferences on the role of chaplains in palliative care. In addition, she was awarded a HealthCare Chaplaincy grant for work on Spiritual Care in Chaplaincy Care in 2013-2014. She serves on the BCCI Specialty Certification in Hospice/Palliative Care Task Force, the BCCI Commission on Certification and the APC Integrated Standards of Practice Task Force. Katrina Scott MDiv BCC-HPCC has been a member of the Massachusetts General Hospital Chaplaincy Department since 2003, first as a per diem chaplain while attending seminary (master's in divinity, Harvard, 2005) and currently serving as Palliative Care Chaplaincy liaison and Oncology chaplain. Her area of concentration in graduate school was pastoral counseling and ethics, with special emphasis on establishing a holistic ministry of healing that acknowledges and respects the heart/mind/spirit relationship. Chaplain Scott has had a lifelong interest in existential/spiritual issues, stemming from undergraduate studies in philosophy and extending into her professional career as a documentary cinematographer for 25 years. Dedicated to promoting a trans-disciplinary team approach to patient/family care, she is endorsed by the American Ethical Union (Ethical Culture) for Health Care Chaplaincy. An officiant of the Ethical Society of Boston, she was granted board certified chaplain status in 2008 and hospice/palliative care certified chaplain status in 2014. She serves on the BCCI Specialty Certification in Hospice/Palliative Care Task Force.